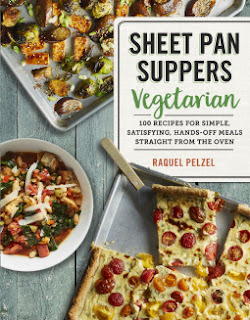 When I first heard about this title I was intrigued by the concept of a cookbook full of recipes that can be made in just a sheet pan. I mean, who doesn’t love a meal that’s quick and easy to prepare with minimal washing up? Sheet Pan Suppers Vegetarian includes 100 recipes spanning a wide variety of dishes all of which are suitable for a Vegetarian diet. In addition around half of the recipes are Vegan and similarly almost half are Gluten Free. Whilst not all of the dishes are suitable for a ‘free from’ diet, many can easily be adapted to suit different dietary needs. In addition to the more traditional sheet pan ideas like nachos, pizza and burgers the book also shares more surprising dishes including several soups! There is even a whole section of dessert recipes to be found at the end of the book and tons of tips and tricks along the way. Some of the recipes I’m most looking forward to trying out are the Vegan Poutine, Roasted Vegetable Lasagna, Crispy Roasted Shallot & Lentil Mujadara and I Can’t Believe It’s Mushroom Risotto!. In a time where most of us rely on a selection of kitchen gadgets for all sorts of different tasks Sheet Pan Suppers Vegetarian showcases just how versatile and exciting cooking with a simple pan can be.